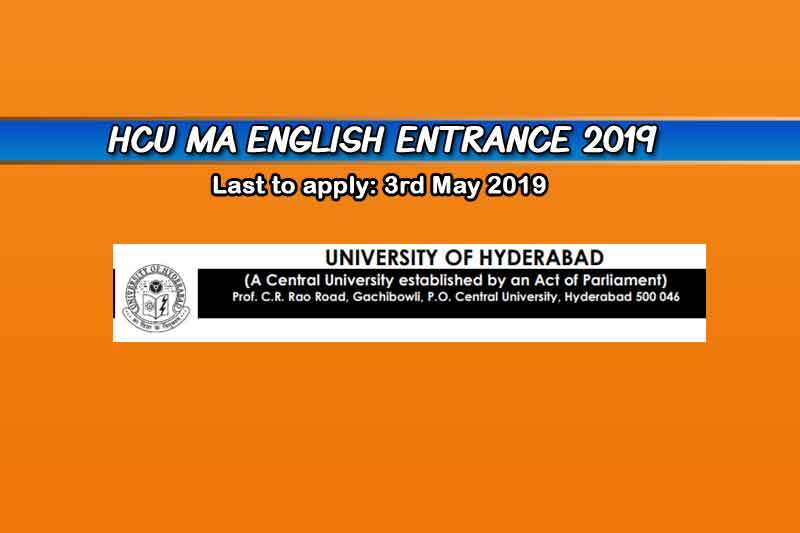 Hyderabad Central University MA English Entrance 2019 dates have been announced. According to which, the last date to apply is 3rd May 2019. The HCU is one of the top premiere universities in India that offer MA English course. Moreover, it is a central university, that’s why it has good infrastructure, quality faculties, and world-class exposure. As per the NIRF 2018, it is ranked 5th among universities in India. The MA English course at HCU is listed as one of the top courses that attract students from across India. However, there are only 49 seats available. That makes the competition stiff. As per the latest notice, the Hyderabad Central University MA English Entrance 2019 exam will be completely objective (Multiple Choice Questions). That automatically increases the difficulty level of the exam. There are other important details of Hyderabad Central University MA English Entrance exam. We have provided everything here for your perusal. If you have questions, feel free to ask using the comment box below. If you need help in preparation then you can join our online MA English Entrance course. Minimum 50 percent in bachelor’s degree with 50 percent marks in English as an optional subject. Or 50 percent in bachelor’s degree with 55 percent marks in English as a compulsory subject. Learning Skills is the leading institute in Delhi enabling students to achieve their career objectives.